DJ Khaled collaborations "I Wish You Would" and "Cold" get the gritty black-and-white treatment, with Rick Ross on hand. DJ Khaled is known for his enviable contacts list, and this time he has called up past collaborator Hype Williams for an unusual two-song video. 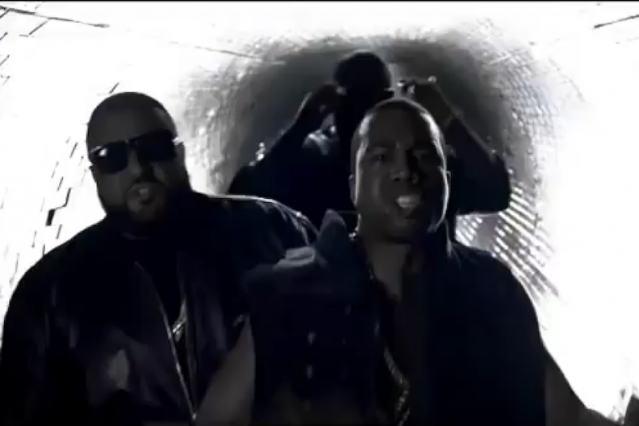 The king of gaudy ’90s rap clips, last seen directing Jack White’s incongruously thrilling “Freedom at 21″ video, goes with a shaky, shadowy, black-and-white treatment for Khaled’s Kanye West collaborations “I Wish You Would” (also featuring Rick Ross) and “Cold” (formerly known as “Way Too Cold,” formerly known as “Theraflu”). Aside from some censored bits, the ominous music sounds the same as ever, Butters-like Kim Kardashian talk and all, but the tense video masterfully allows you to overlook lyrics like “flyer than a parakeet,” transforming two iffy tracks into a bona fide pop event. The best-connected guys with the fattest bank accounts win again.